How do the world's leading cameramen capture the perfect shot? What does it take to make an audience swoon before the silver screen? Masters of the craft explore their relationship with the moving image. Featuring interviews with the visionaries behind 'The Godfather', 'Apocalypse Now', 'City of God' and many more, this doc is a breathtaking behind-the-scenes look at the visual magic at the heart of cinema's most iconic moments. “A lot of success is a lot of luck”, admits Roger Deakins (The Shawshank Redemption, No Country For Old Men), but of course having the "willingness to actually compromise your personal life” is part and parcel of pursuing a career in filmmaking. Recalling his breakthrough role working on Around the World with Ridgeway, Deakins laments: “when I came back to my girlfriend’s place there was another toothbrush in the bathroom, but you can only expect that kind of thing can’t you. I’d been away for a year, you know”. Following years of successful filmmaking, the visual geniuses behind some of cinema’s most memorable images move from anecdote to anecdote as they discuss their life’s work. On colour, differences of opinion abound: “colour is so often a distraction, and is so often used as a confection”, argues Deakins, while Vittorio Storaro (The Conformist, Apocalypse Now) refers to a “kind of philosophic concept of colour” that he drew on throughout his work. 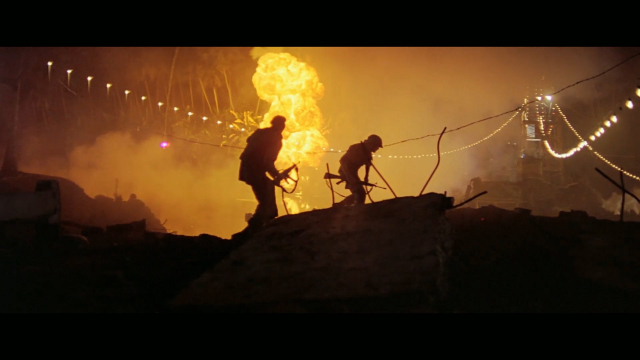 Full of provocative contrasts and emotive tones, natural light, meanwhile, is every cinematographer’s dream. “Natural light, it’s the inspiration for filming”, confirms Cesar Charlone (The Constant Gardener, City of God). Yet with scenes that require hours and even days to create, filming during the little time that dawn and dusk allows presents filmmakers with a constant challenge. “I had a whole plan of all the shots and the time of day that I wanted to shoot them”, says Deakins of a 23-shot sequence from No Country for Old Men. Moving onto another crucial facet of filmmaking, John Seale (Mad Max: Fury Road, The English Patient) ruminates on director-cinematographer relationships. During rehearsals, particularly with child actors, Seale reveals that “we’ve often just given each other a nudge and a wink, and okay, we’ll roll on it”. He describes the "lucky accidents" from which some of cinema's most iconic shots have emerged. Though being the sole guardian of the image - before the screen monitor was invented - held a momentous responsibility for the cinematographer, “the rushes in the early days were so exciting”, says Seale. He recalls when the whole crew would gather together in the screening room to see how their shots had turned out. Now, however, “everyone can see whether it works or doesn’t work, and that changes relationships”, says Charlone. From the first screen monitors to the game-changing developments in post-production taking over from on-set work, there is no doubt that the filmmaking process has evolved over time. Yet, as Storaro affirms, “whatever tools we’re using, there is something that cannot be changed: the idea”. Keepers of the Magic is both an eye-opening introduction to cinematography, and every film buff’s dream. Listen to an interview with director Vic Sarin, here. After beginning his career in Australia, Sarin emigrated to Canada and went on to become one of Canada's most celebrated Directors of Photography, receiving Genie, Gemini and Emmy nominations and awards. He is the recipient of the Kodak Lifetime Achievement Award for having created some of Canadian cinema's most moving and memorable images. Vic's work on feature films such as Margaret's Museum, Dancing in the Dark and On My Own earned him world renown as one of Canada's premier cinematographers. Tina is a creative partner in Sepia Films. For the last two decades, she has developed projects and relationships internationally through her extensive work on US, Canadian and International co-productions. Tina has developed, consulted and produced for both film and TV in Canada, the US, India, the UK, China, South Africa, Ireland, Spain and Argentina. Alongside Kim Roberts, Tina has established the development company Honalee Productions and has begun to produce feature-length television programs. Together with Tina, Kim has produced Sepia’s feature films The Games Maker (2014), a co-production for Disney starring Joseph Fiennes, Ed Asner and David Mazouz; In Their Skin (2012), a suspense thriller starring Selma Blair and James D'Arcy, and a number of others, as well as the feature documentaries The Boy From Geita (2014), Hue: A Matter Of Colour (2013), and And The Beat Goes On... (2009). Kim also executive produced the Canada/UK cult classic It’s All Gone Pete Tong (2004). 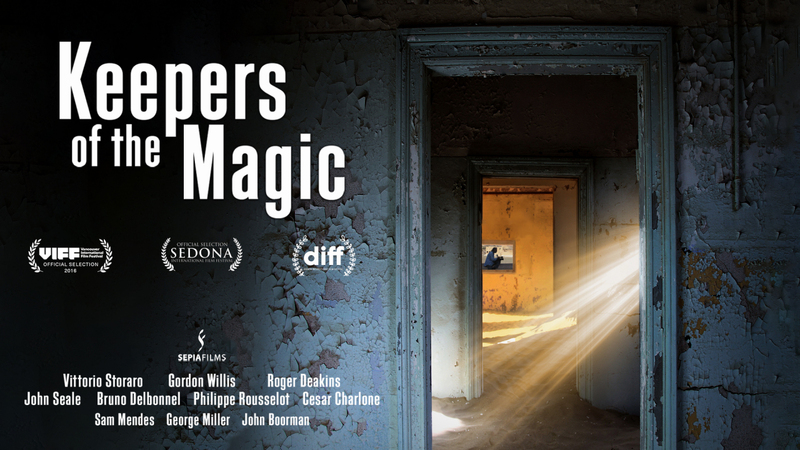 Keepers of the Magic is composed of a series of interviews with world-class cinematographers. Director Vic Sarin, who believes that cinematographers are responsible for the ‘magic’ of movies, spoke to a number of these often-overlooked filmmakers including Vittorio Storaro (The Last Emperor, Apocalypse Now), Roger Deakins (The Shawshank Redemption, The Big Lebowski) and Gordon Willis (The Godfather trilogy) in the making of his documentary.